Nothing impacts more on citizens than taxes, and nothing has had more impact on the way taxes are administered than the information technology revolution. This volume analyzes the experiences of a dozen or more countries in their effort to use information technology to improve taxpayer service, compliance, and revenue performance. Administrative re-engineering using information technology is the order of the day. Information technology is changing the boundaries of tax administration from isolated single tax administrative units, to unified tax authorities that administer all taxes including the functions of customs. Information sharing by the many areas of tax administration is the key to reducing compliance costs borne by taxpayers, as well as enhancing the levels of voluntary compliance with tax laws. Private sector service providers are becoming an integrated part of the administration of taxes. The tax administration system of the future is likely to operate much more like the service oriented financial services sector of the present, than the heavy handed, and too often corrupt, bureaucratic institutions of the past. 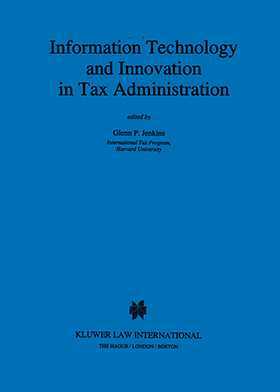 This volume provides some insight into what is being done now, including a sobering discussion of the implementation problems being faced, in order to bring the possibilities of the information technology revolution into the reality of tax administration.